As a historically Roman Catholic country, France has more than its fair share of beautiful churches and cathedrals. While most tourists visit the Notre Dame Cathedral in Paris, many may not realize that another one of France’s most impressive cathedrals is only about a 45 minute train ride outside of Paris. In fact, it has even been classified as a UNESCO World Heritage Site since 1991. 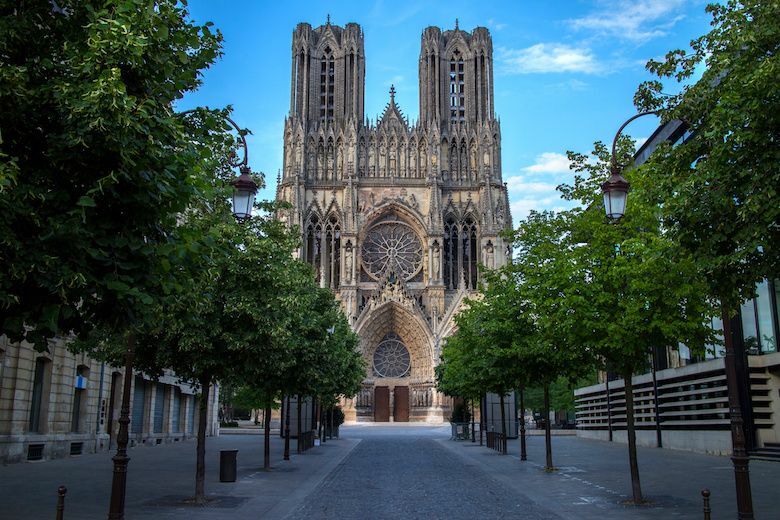 In this guide, you’ll learn the history behind the Cathedral of Reims and some of the interesting facts that surround it. You could spend two weeks in Paris and still not see all of the amazing museums and attractions that the city has to offer. However, after spending a few days of Paris tours, seeing the Louvre, Catacombs or maybe even a Le Marais food tour, venturing on a Paris day trip is a great idea. One of our most popular Paris day trips is our Day Trip from Paris to the Champagne region, which allows you to visit a few different Champagne houses in a few of the region’s most beautiful towns. The Notre Dame de Reims Cathedral, or simply Reims Cathedral, is named after the city it was built in. In French, Notre Dame means “Our Lady”, so the literal translation of the cathedral’s name is Our Lady of Reims. Before delving more into facts on the cathedral, it’s worth mentioning that Reims is probably one of the most difficult French city names for anglophones to pronounce. Our best advice is to think of it as the word ‘rance’, but with a strong nasal accent. Whatever you do, don’t pronounce it as ‘reems’, or you might not get very good directions. When you step into Notre Dame de Reims, you’ll be walking in the footsteps of some of France’s most famous figures. That is because the cathedral was the site of the coronation of 31 French kings, beginning with Louis VIII in 1223. Perhaps the most famous coronation held at the site was the crowning of Charles VII in 1429, which was done in the presence of Joan of Arc. The last coronation held in the cathedral was that of Charles X in 1825. In fact, the original Reims Cathedral, which burned down in 1211, was even the site of the coronation of Clovis I in the late 5th century AD. Known as the King of the Franks, Clovis is an immensely important part of French history and is referred to as the first king of what would eventually become France. Besides its impressive historical significance, the Reims Cathedral is recognized as one of the greatest examples of Gothic architecture still standing in Europe today. While seen as a classic example of 13th century French Gothic art, because the cathedral was damaged over the years and throughout both World Wars, examples of more recent architecture are also visible. One of the more fascinating examples of the cathedral’s blending of history is the fact that the interior features stained glass ranging from the 13th to 20th centuries. In 1974, the same man who designed part of the ceiling of Paris’s infamous Opera Garnier, Marc Chagall, designed the stained glass in part of the Reims Cathedral. If you think the Reims Cathedral deserves a visit, it’s worth noting that the city of Reims is commonly referred to as the unofficial capital of France’s Champagne region. That means Reims makes the perfect day trip for those looking to combine amazing history and architecture with Champagne tasting!